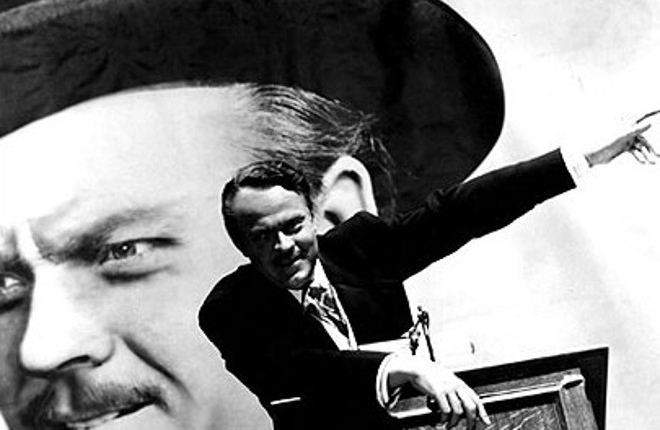 Citizen Kane is one of those pop culture touchstones that most people are aware of in some way, regardless of whether they have seen it or not. That’s not surprising; after all, it has a big reputation (it is often touted as being the greatest film of all time), a scandalous history (outraged by similarities between the film’s lead and himself, media mogul William Randolph Hearst tried to destroy the film – literally!) and is the source of countless pop culture references (many classic moments from The Simpsons are direct homages to the film). This is clearly gripping stuff, and the 100 minutes (give or take) that follow are well worth the extensive analysis by critics the film has undergone in the decades since its first screening in 1941. But is it actually the greatest movie ever made? Like all films held up as being the best of all time, Citizen Kane is simply an example of very good filmmaking, which manages to be hugely entertaining and thought-provoking despite the odd rough edge in its otherwise smooth facade (in this case, occasionally hammy acting and underdeveloped supporting characters). However if you were to ask, “Is Citizen Kane the most influential movie of all time?” then the answer would almost certainly be yes. I can still remember watching Citizen Kane for the first time a few years ago and being constantly blown away by the seemingly modern cinematic techniques on display. This old black and white movie had everything you’d expect to see in a contemporary release, from elaborate camera moves (including a terrific crane shot up the side of a building, through the neon sign atop the roof and then down through a skylight to the club within!) to believable special effects and make-up (the artificially enhanced interior spaces and crowds are utterly convincing, as is Welles’ physical metamorphosis from dashing young enfant terrible to bloated, middle-aged shut-in) and intricate storytelling structure (the narrative of the film is non-linear, with Jerry’s investigation in the present intercut with flashback sequences depicting the events of the past and drawn from the accounts of Kane’s peers). The fact that all these now-commonplace artistic and technical elements are all present in Citizen Kane just goes to show how much of an impact the film has had on everything that followed (and that’s without going into the pioneering cinematography by Glegg Toland, which emphasised then-cutting edge deep focus shots; in these shots everything in the frame from the foreground to the background was crystal clear, allowing for a higher level of realism than was previously possible). Whilst many of these creative ingredients had been used before in isolation, it took Welles and his team to bring them all together under one roof, in the process inspiring filmmakers to view cinema as its own unique storytelling medium, rather than as a showcase for what often amounted to pre-recorded plays. But for all its lofty accomplishments behind the curtain, what really makes Citizen Kane a fantastic film is that it tells a genuinely interesting story about a compelling, relatable lead. Stories based around the rise and fall of a flawed protagonist lend themselves naturally to pathos, and Welles exploits this to its full extent. For all that Kane is never portrayed as being entirely on the side of the angels (even as a crusading journalist, his methods are far from admirable), through a combination of top-notch screenwriting and Welles’ own charismatic and layered performance, he remains a character we both root for and pity. We watch as he continually acquires possessions (and people) he will ultimately ignore in his desperate attempts to possess and control a world too large for even his reach, and we empathise with him, knowing from experience that he was always doomed to fail. Moreover, who could watch the scene set late in Kane’s life, when he muses on the man he has become and wonders what might have been had circumstances been different, and not feel a sense solidarity with the old tycoon? The film offers more than a mere character study, however. By employing a flashback structure, it is able to build a portrait of Kane that reveals a complex man who changed constantly and yet also remained the same; in doing so, it asks bigger questions about whether an individual can ever be truly known by others as more than aspects of an unseen whole, and whether a life can be summed up in a single word. When “Rosebud” is revealed to be the name of Kane’s childhood sled in the final scene, both of these questions are expressed in full, and the audience is left to answer them. Do we accept that Kane spent his dying moments fixated on memories of his childhood and lost innocence, suggesting a yearning for redemption within his soul that ran deeper than his peers could ever know? Is this single character trait therefore more symbolic of the man than anything else we have seen over the course of his life, solely because it took centre stage in time for his last bow? Can we really say? If we reject Kane’s thoughts about his boyhood sled as nothing more than cerebral jetsam cast adrift by the storm of his synapses firing their last, do we then draw the conclusion that his last gasp held no meaning at all? And if “Rosebud” has no meaning, do we question whether a person’s life (especially one led by a man as enigmatic as Kane) can ever be reduced down to a trite combination of letters? Neither of these questions can actually be answered conclusively, of course. Like many of the great movies, Citizen Kane is able to emulate real life by providing more questions than it does answers. As in life, what makes things interesting is continually wrestling with unanswerable questions in order to reach answers you find satisfying, with your answers almost certainly changing over time. All things considered, in reviewing Citizen Kane I’ve come to the conclusion that it has a lot in common with its tragic protagonist (not to mention its infamous director): its ambitious, engrossing, mesmerising and ultimately falls short of the impossible standards it sets itself. Fortunately, the most important way in which the film and Kane resemble each other is ultimately in their shared ability to completely transfix anyone who has observed them, even well after they have faded from view. Soapbox: So what is The Pop Culture Studio all about?